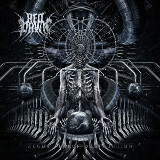 Newcomers to the scene, Red Dawn nonetheless has a strong showing in the form of their debut, Algorithm of Destruction. Taking some of the wild talent found in The Faceless albums, taming it with lots of regularly scheduled beatings, and adding a Decapitated-style set of tight rhythms, they deliver forty-five minutes of nice face-melting here. Diminished arpeggios and sweep pickings are strewn throughout the album, and the band rarely gets tired of them. Ordinarily the listener might, I suppose, but in this case everything is done so precisely and mixed so well that it all feels like a part of the whole rather than an end in itself. Strange Dreams, a favorite of mine, combines those arpeggio leads with rhythm that subtly changes speeds throughout the track, and the more direct death metal tracks emphasize razor-sharp precision to the notes and beats, doubling up the melodies at times over the same beat in a style that verges on neoclassical, such as on Looking Through the Eye of God -- its successor, and one with some of the best soloing on the album. Unlike some of their influences, no overtly sci-fi themes surface, and vocoders and theremins stay away -- only unpretentious, precisely-done death metal here. The arrangement of the time signatures and riffing keeps getting more and more intricate throughout the album, although Fall of Curtain brings some of that back to earth with a less jazzy rhythm that relies on furious speed, the two guitars running full tilt while still in tighter formation than the Blue Angels at an airshow. The final track is the neatest of all, with long passages of jazzy acoustic guitar accompanying the leads in a departure from the regularly-scheduled death metal -- a nice surprise at the end. Fans of progressive death greats, who don't mind a band that indulges its taste for arpeggiated soloing, will find this one a fun and easy-to-appreciate tech-death listen.